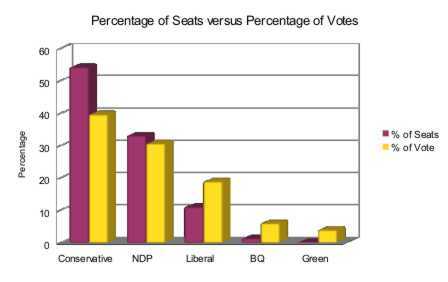 I don’t think we should expect Jack Layton to promote proportional representation in the House of Commons. It is true that in the last parliament his party supported a private member’s vote on looking at voting reform. 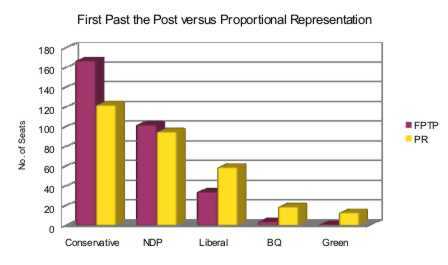 However, the NDP didn’t have an on-going commitment to support proportional representation. The party just raises this issue for one or two days every couple of years just to keep a PR advocate like myself happy. Seriously, if we Canadians want to have a democracy that includes proportional representation, we are going to have to be as vigilant as the Egyptians and Tunisians were when they demanded that their countries become democratic. Our actions in Canada may need to involved creating our own “democracy squares” within our major cities across Canada. Until we do that, we will never get proportional representation. We need to let our fellow Canadians know that without proportional representation, we do not live in a democratic country.